Put your needles down, ladies, no point in trying anymore, The most beautiful mittens in the world have just been knit. By me. 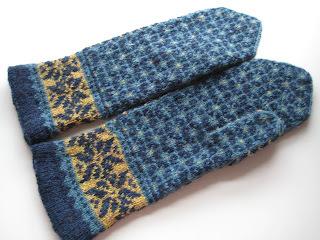 These are Postwar mittens but with a "manlier" cuff, knit for the person I want to warm most in the world. They are knit in "Shetland wool" bought at Yll & Tyll in Uppsala (in the reciever's presence, but he totally bought the "this could be good to have in the future"-excuse), in navy, a blueish green and honey yellow. 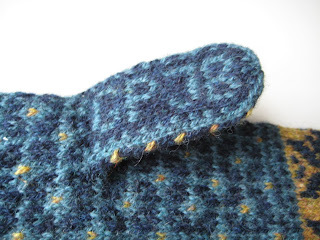 And instead of knitting only the year on the inside of one of the thumbs, I also knit the full initials of the receiver on the inside of the other one. 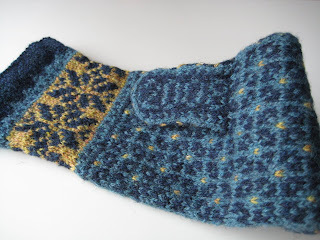 I love the yellow dots and how they light up the mittens, I love how much they feel like artwork rather than knitwear, and I love how much the receiver loves them. Thanks to Fi for helping me invent the cuff pattern. 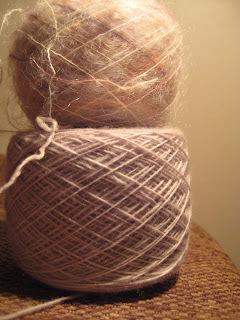 It's one hank of Malabrigo lace (bottom) and one hank of Colinette Parisienne (top). The story is that when my mother saw my new Simple pleasures hat when I was home for Christmas, she wanted one too, and since it's her birthday in a few weeks I obviously have to knit one for her. She wanted white, but that's too boring for me so I went for this pale gray/pastel composition instead. How very thoughtful of me. 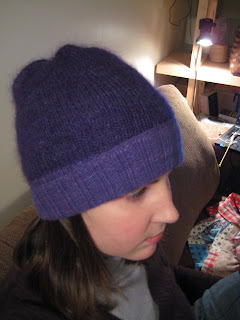 I have this quest for the perfect hat, which makes me knit one or two each winter. I had already knit one (a great one) this fall, but since it despite my efforts to make it different looked a whole lot like the one I had knit for my boyfriend a few months earlier I can't wear it when I'm with him, which is quite often. This hat is knit with Malabrigo lace, kindly given to me by Fi in our Forever Swap, and Kidsilk Haze in a shade I ordered online and thought would be more like the Malabrigo in colour than it is. The hat is super cozy but I don't like how it's not solid in colour. My quest for the perfect hat continues. It's wool, and it's super shiny. 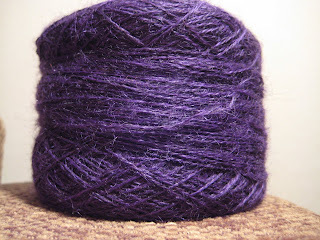 Perfect for a lace shawl. I also got matching glass beads, so this could be a super luxurious/glamorous shawl. When I get the time and stumble upon the perfect pattern. 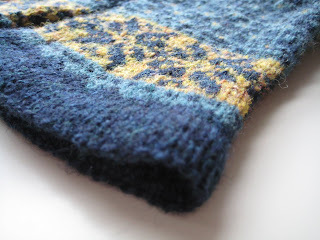 I hope to get back shortly (yeah right...) with pics of the prettiest mittens ever knit. I just have to find my darning needles first.